No longer forced to operate in the shadows, marijuana growers are learning to make their farming friendlier for fish. Sunshine Johnston has been growing marijuana on her 2,000-square-meter Humboldt County, California, farm since 2013. She grew up in the area, in a community of homesteaders, or “back to the landers,” and many of her neighbors grew cannabis. But the drug was illegal, and during the 1980s war on drugs, helicopter flyovers and raids were commonplace. Entire farms were seized when one plant was found. Despite the threats, for Johnston and her community, the plant was a way of life. Rather than cease growing, many retreated to the surrounding hills and forests, and boosted their crops in ways that often harmed the environment. Making heavy use of fertilizers and illegally tapped water supplies, Northern California’s pot farmers contributed to the already heavy toll being wrought on the region’s waterways by agriculture, industry, and recurrent drought. It was the most recent severe drought in California that prompted a group of fish advocates, concerned about the effects of marijuana farming on local waterways, to reach out to Johnston and other farmers along the Eel River, California’s third largest watershed. For the past four years, Johnston has been working with experts from the Eel River Recovery Project (ERRP) on a program sponsored by the Institute for Fisheries Resources (IFR), a branch of the Pacific Coast Federation of Fishermen’s Associations (PCFFA). The program is designed to help Humboldt County’s cannabis growers adopt fish-friendly techniques. “The Eel River watershed community really took the bull by the horns here and solved a problem that government simply could not have tackled,” says Tim Sloane, who was the executive director of the IFR and PCFFA when the program was designed. “They’re protecting and restoring endangered salmon through community building, cooperation, and education.” To date, ERRP has worked with about 70 farms. A major target of the program is to curtail cannabis farms’ substantial water use. Each plant needs about 20 liters of water a day, and the total number of farms pumping from the Eel River remains unknown. Another major focus is the implementation of nutrient-cycling techniques meant to cut down on nitrogen-rich fertilizer runoff, which contributes to algal blooms and deoxygenation of the water. When chickens are raised alongside crops, for example, they weed, scratch, and fertilize fields by scattering their manure as they go. This approach yields “much lower operating costs, so it’s a win for [the farmers] and the environment,” says Dodd. On her farm, Johnston puts eggshells in the soil around her plants to release calcium and deter slugs. She also pulls humus from the base of a towering giant redwood and tosses it on her compost pile. Johnston says that she, and other growers in the region, believe that farming sustainably is not only the right thing to do, but is also good branding as the industry develops and growers angle for future shelf space. The 2016 vote to legalize recreational marijuana in California is beginning to change the situation for both growing and selling cannabis. “Now, with prohibition lifting,” Johnston says, “I can come out of the shadows.” She plans on expanding her farm to 40,000 square meters, and implementing even more water-wise techniques, such as a rain catchment system in the form of a pond or holding tank. Johnston believes that if corporations start growing pot industrially in the state, having an environment- and fish-friendly artisanal product will give a competitive edge to Humboldt County cannabis. Maria Finn is a journalist and author. She spent eight years working in the Alaska fishing industry, including crewing on an all-female salmon seiner. Currently, she lives on a houseboat in Sausalito where she has an oyster garden. 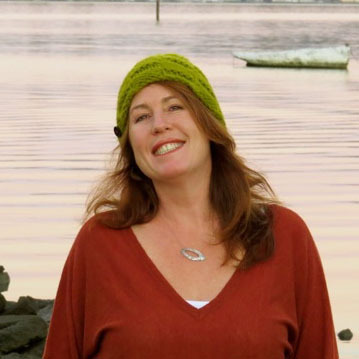 Cite this Article: Maria Finn “Cannabis Chronnoisseurs Are Tapping the Budding Fish-Friendly Pot Business,” Hakai Magazine, Mar 20, 2017, accessed April 25th, 2019, https://www.hakaimagazine.com/news/cannabis-chronnoisseurs-are-tapping-budding-fish-friendly-pot-business/.